A heavy rain warning is in force for the Eastern and Interior of Viti Levu which includes Korovou, Nausori, Rewa, Naitasiri, Suva through to Navua. The heavy rain warning is also in force for Vanua Levu, Lau and Lomaiviti group. The Weather Office says rain is expected to become frequent and heavy from later today and isolated heavy falls may lead to localised flooding of low-lying areas. This rain is being brought by a Tropical Depression that is expected to pass over the Northern Lau Waters later today. It is expected to affect parts of the country until Sunday. 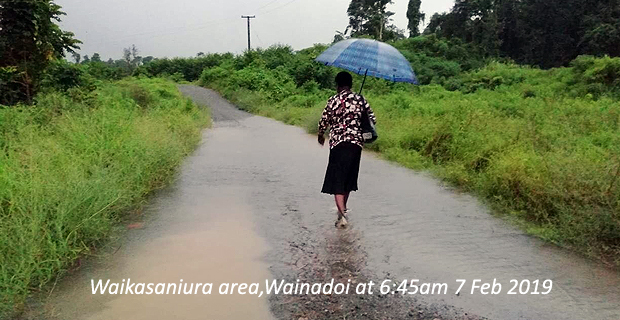 Meanwhile, residents of Waikasaniura in Wainadoi are stranded this morning as Waikasaniura Road is flooded. Resident Monika Prasad says it started raining in their area at about 4.30 this morning. Prasad says only heavy goods vehicles can pass through the road.